A free fireworks event in the Staffordshire market town of Tamworth is back with a bang - literally - as it promises to celebrate its 10-year extravaganza in spectacular style. 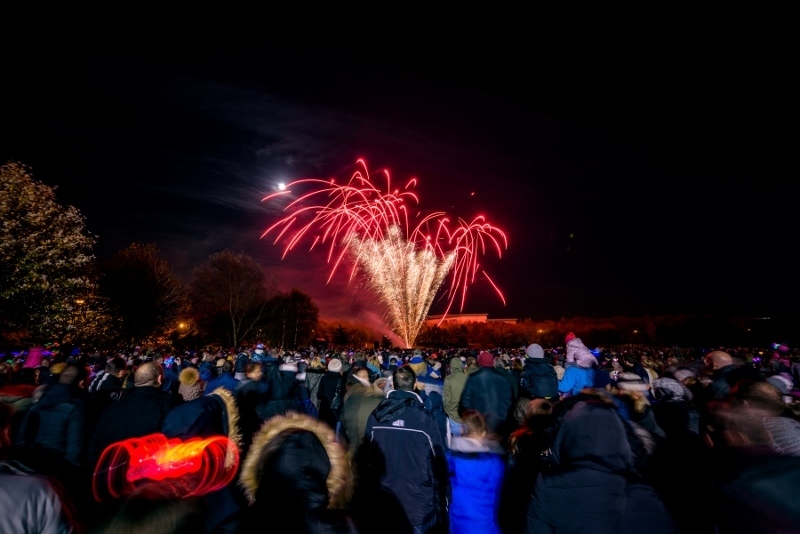 Tamworth's free fireworks display, the town's biggest and most popular annual event, returns to the picturesque Tamworth Castle Grounds on Saturday 3rd November. The fireworks festival will include an evening of fun for the whole family, including the spectacular display of fireworks. The entertainment, which begins at 5pm, includes fire performers, face painting, a sparkler zone, family activities, artisan food stalls and a fair. This year the spectacular display of fireworks will start at the earlier time of 7pm, as voted for by members of the public in an overwhelming response to a recent online poll. Organised by Tamworth Borough Council's Arts & Events team, the annual extravaganza has become a firm favourite in the town's annual calendar of events and has attracted upwards of 25,000 people in recent years. This year is expected to be no exception. 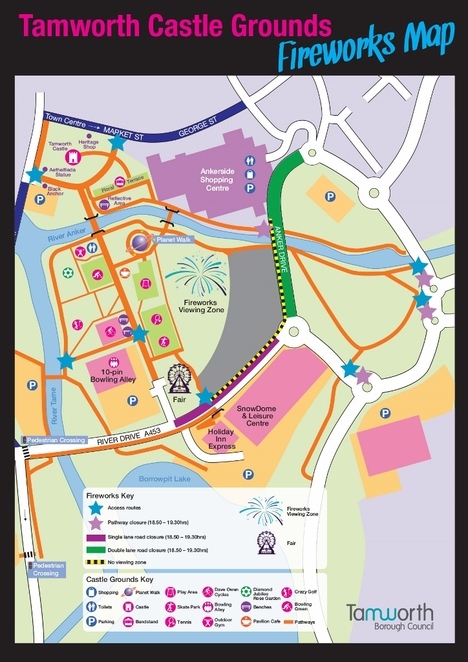 Due to the event's increasing popularity, visitors are asked to plan ahead and be patient when travelling to the town centre and moving in and out of the main arena. People are advised to walk or use public transport where possible and to arrive in plenty of time for the fireworks as some footpaths around the area will close during the display for safety reasons. There are a few operational changes this year which have been designed to help ease the flow of people exiting the event, so visitors are asked to look out for signs and follow instructions from the stewarding team. The fireworks spectacular is sponsored by Tamworth's Ankerside Shopping Centre. 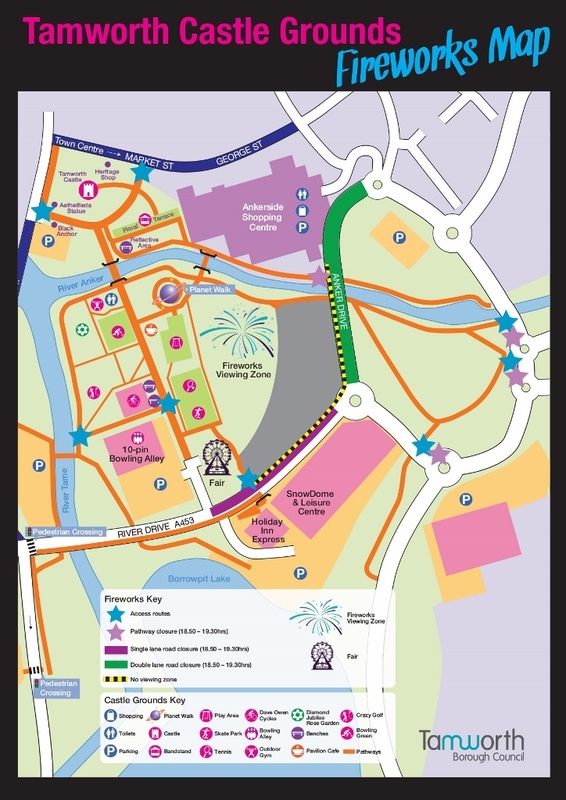 A map of the road closures for pedestrians and vehicles can be downloaded from: www.tamworthartsandevents.co.uk/fireworks-extravaganza. Councillor John Chesworth, Tamworth Borough Council's Cabinet member for Culture and Operational Services, said: "The annual Tamworth fireworks display is a fantastic event and we're delighted to be able to host this every year for thousands of people to enjoy free of charge. The event is celebrating its 10th anniversary and has become really popular with Tamworth residents and visitors to the area over the past decade. The event has attracted up to 25,000 people in some years and obviously there is quite a lot involved in the logistics of getting everyone in and out safely. Activities such as fire performers and the fair will continue after the display, so families are welcome to stay and enjoy the fun while the crowds disperse. Overall, we're hoping for another successful fireworks extravaganza so we can really celebrate the 10th anniversary of this popular event with a bang."